If you’re planning to retire (or are currently retired), I urge you to become intimately familiar with monthly dividend stocks. They offer the ultimate consideration: income payments that actually line up with your monthly bills. Today, I’m going to help get you started by introducing you to four monthly dividend payers that yield up to 12%. But first: What’s so great about this type of stock? When you pay your bills – be it the mortgage, the electricity, the TV – you don’t sit down at the kitchen table to do that every quarter. You do it every single month. But most dividend stocks don’t keep the same kind of schedule. American stocks typically pay shareholders once every three months. 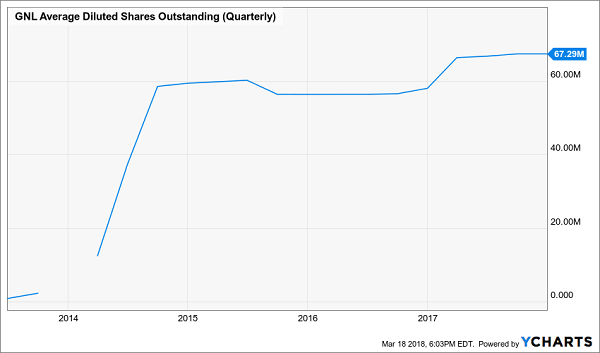 It’s a sign of stability: Promising a dividend check every single month is a bold promise that a company wouldn’t make if it wasn’t serious about keeping (and even raising) the payout. Faster gains. Even if you have 20 or 30 years left to retirement, a monthly payout can be put back to work more quickly than a quarterly one. A monthly payer, in fact, can generate thousands of dollars more in additional returns via reinvested dividends over the course of a couple decades than a quarterly payer with the same yield. Are all monthly dividend stocks perfect? Far from it. Today, I’m going to show you four payers yielding between 4% and 12%. Two should make your wish list, while two are proof that even monthly dividends aren’t always perfect. LTC Properties (LTC) is one of the more interesting plays in the real estate investment trust space, combining health care and retirement properties in a way that’s tailor-made to capture the potential of the aging Baby Boomers. The company’s fourth-quarter and full-year earnings report didn’t exactly include screamingly positive results. Q4 funds from operations declined by a penny per share from the year-ago period to 77 cents per share, though for the whole year, FFO improved from $3.06 per share in 2016 too $3.10 per share in 2017. Still, shares have hemorrhaged more than 25% since July of last year, with some of that coming amid the malaise of the broader REIT space. That has LTC selling at less than 13 times FFO, and yielding nearly 6%. That should give investors plenty to think about, especially when you consider that LTC’s properties naturally benefit immensely from the aging of America’s Boomers, and have the added bonus of being located in areas that have high demand for senior health care services. Also appealing is a low debt burden of around 30% of its market capitalization, as well as a dividend that represents less than 75% of FFO. Wall Street sometimes lets momentum get the best of it, and that appears to be the case in LTC Properties. This REIT is positioned for growth yet value-priced – and a substantial monthly dividend only makes it look that much better. At first blush, Global Net Lease (GNL) looks like a prime opportunity. You can’t ask for more diversification than what GNL offers. This real estate investment trust boasts 321 single-tenant properties it leases out to 100 tenants across 41 industries in eight countries, including the U.S., the U.K., Germany and Finland. The industry diversification is outstanding, with financial services the largest slice of the pie at just 14%; but its properties span everything from aerospace to healthcare to utilities. Moreover, its tenants include stable companies such as FedEx (FDX), Family Dollar and ING Groep (ING), but no one of them makes up more than 5% of straight-line rent. Moreover, the stock has been battered to the tune of about 30% in a year, driving its yield to well over 12%. While Global Net Lease does continue to post growth, its share count is expanding, too, diluting the value of its business. 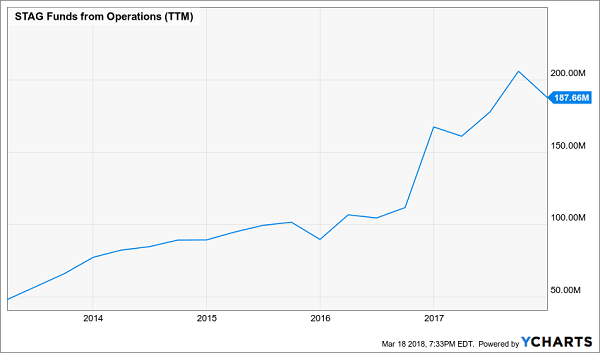 Moreover, the company also pays out fees to external management that drag on operations, and in fact, that healthy dividend isn’t perfectly covered. Last year, the company paid out $2.13 per share in dividends but only collected $2.03 per share in core funds from operation. The dividend is a real concern here. The payout hasn’t budged in years, and now GNL is overstretching to keep its promises. While a 12% yield is tempting, it may not be a 12% yield for long. I have written about STAG Industrial (STAG) before, and in the context of monthly dividend stocks, it’s worth mentioning it again. Three of STAG’s top 10 tenants are XPO Logistics (XPO), FedEx (FDX) and DHL – companies that have plenty to gain as more people have their goods delivered rather than make their way to the store. And as more retailers move to this model, they too will need the kinds of facilities that Stag provides. The fundamental story here still looks great. STAG grew funds from operations by 7% to $1.69 per share in 2017, and occupancy sits at 95.3%. Moreover, the company increased its dividend again – the third hike in 12 months – to 11.83 cents per share. That means STAG’s monthly check is well covered, with a roughly 84% FFO payout ratio, and at 14 times FFO, I would consider this attractive REIT fairly priced. Shaw Communications (SJR) is a Canadian telecom with a hefty yield at the moment. The question investors want to ask themselves is, are they getting a still-stable payout such as those from AT&T (T) or a Verizon (VZ), or are they getting an eventual dividend cut a la Frontier Communications (FTR) or Windstream (WIN)? The answer is somewhere in between – and that’s not a good thing. Shaw, which offers internet, television, telephone and other services across several provinces, is in the midst of a self-proclaimed “total business transformation” that includes a heavy renewed push in its wireless business to help offset continued declines in wireline operations. The company will be taking a $450 million charge related to this restructuring, including accepting 3,300 employee buyouts. All told, the company is reducing its workforce by roughly a quarter. The market has been punishing SJR shares, which are off more than 17% since Jan. 1. That has helped plump the yield up on this monthly dividend payer to nearly 5%. However, SJR remains more expensive against future earnings estimates than rivals such as Telus (TU) and Rogers Communications (RCI), and its path to normalcy is far from clear. Among other things, it still will have to find funds to make itself competitive in the upcoming push to transition from 4G to the newer 5G technology, which includes buying spectrum and upgrading its network. While 5% is nice if you can get it for AT&T or Verizon, which enjoy an effective duopoloy in the U.S., it still doesn’t seem quite enough to justify a purchase in Shaw, which faces a much less sure path ahead – especially in the short-term. Monthly payers deserve a place in your portfolio, period. If you’re retired, they keep your cash flow as smooth as silk. And if you’re not retired, you can reinvest your dividends faster—giving your nest egg a nice extra boost. If that’s not a win-win, I don’t know what is! That’s why I’ve dropped four monthly dividend stocks into the “6 pack” of steady investments that make up my . Quality monthly dividend stocks are a rare breed, but with the right picks, you can use the power of faster compounding to achieve a fully paid-for retirement for around $500,000 – more than a quarter of a million dollars less than the suits at Merrill Lynch say you need to retire well! And then once you hit retirement, you can collect a smooth, steady stream of monthly dividend checks to use against your monthly bills. That’s as win-win as it gets! 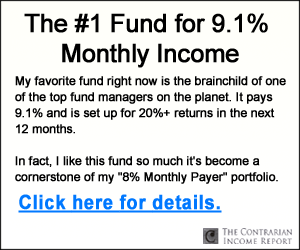 My “8% Monthly Payer Portfolio” can hand you a rock-solid $40,000 per year in regular income. That translates into a steady drip of more than $3,300 per month that won’t vary – other than the occasional payout increases granted by these dividend dynamos, that is! This strategy isn’t capped at $500,000 – if you’ve saved up even more, you could be looking at monthly income of $6,349 or even $12,698 per month. That pummels the kinds of payouts you would see from a basket of quarterly-paying Dividend Aristocrats. One last bonus: Several of these picks are more than just slow-and-steady dividend drippers – they also possess several catalysts for growth, meaning they can deliver income while growing your nest egg! That’s a vital part of retirement that many people overlook, convinced that their only strategy after age 65 is to watch their portfolio wither as they start to take withdrawals. That’s just not true! 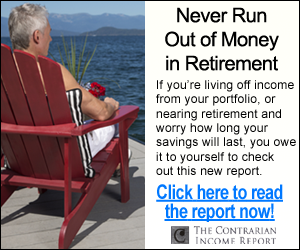 I’m ready to give you everything you need to know about this dynamic retirement portfolio now. CLICK HERE and I’ll share my proven monthly-dividend strategy, plus the names, tickers and ALL of my research on these 6 income wonders.